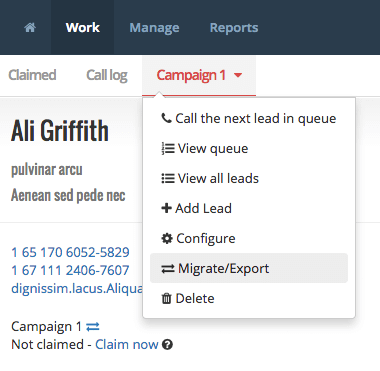 Use migrations to move or export leads, or change their status in myphoner. The Lead Migration Tool is the building block of your sales funnel design. This is where you move your leads from one list to another, or from one step in your sales pipeline to the next. In myphoner, a List is the basic denomination of a lead collection. We chose to call it a list, but you can call it a campaign or a pipeline step if it suits you better. It depends on the context. For the purpose of migrations, these terms are completely synonymous. But depending on the reason why you are migrating leads, you might prefer one term over the other. Just keep in mind that synonymy. Choose Export/Move in the context menu of the list. The context menu is the button you see in both the Manage Lists screen, and the Work screen. When migrating, you need to decide what leads to migrate. You must choose a list for the migration as well as an action. The rest is optional. If you do not fill in the states and categories, all leads will be migrated. 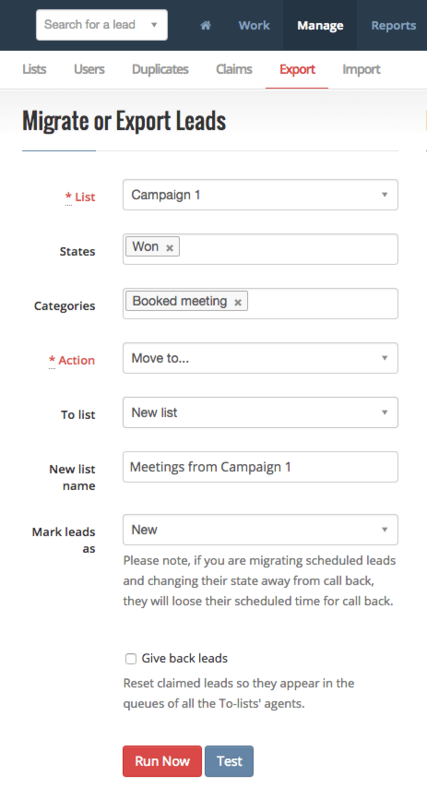 Pro Tip: You can migrate a single lead to another list by clicking the icon next to the list name when viewing the lead. If you are migrating to an existing list, the two lists must have identical fields (order of fields doesn't matter). If the fields are not identical, the migration will fail with a warning telling you what fields it couldn't match. When migrating to a new list, the fields are simply cloned. 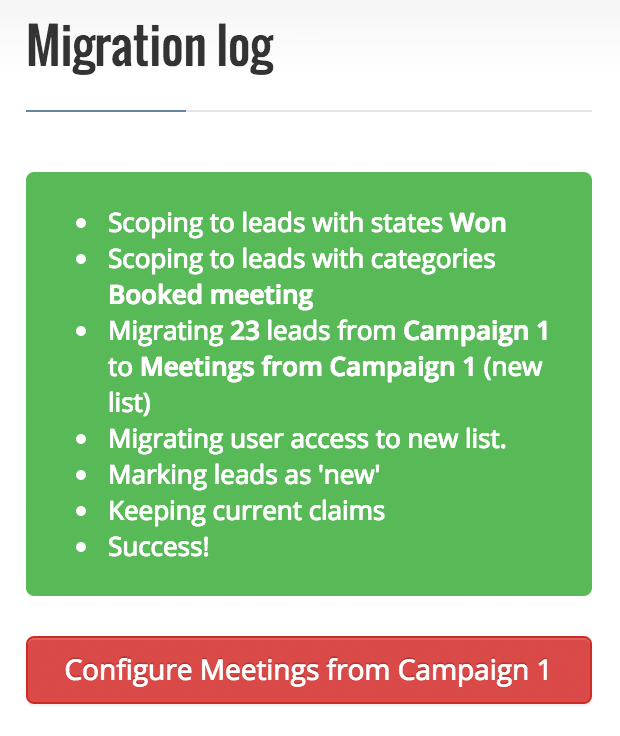 Choosing the scope of a lead migration. To make it clear what will happen, before it actually happens, we provide a migration test, that will simulate the migration without changing anything. When you think your scope is right, simply click the Test button and wait for the result. 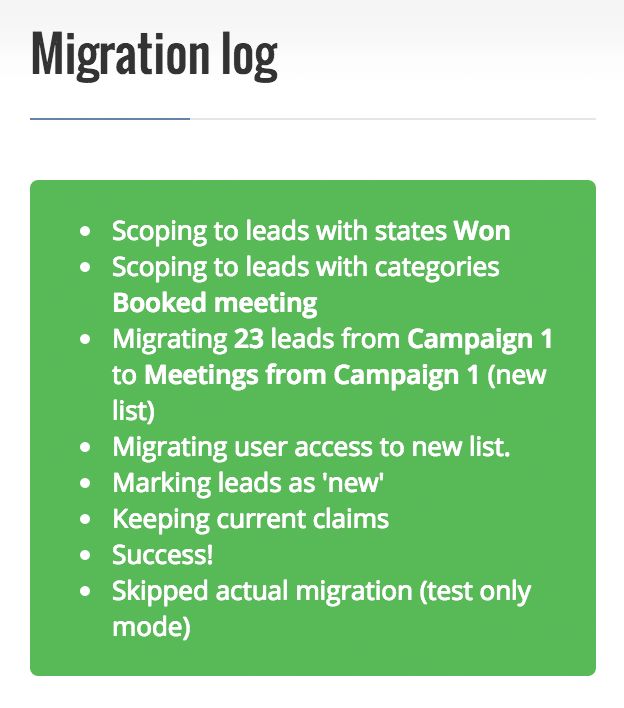 When the simulation is over, the migration log will show you what is going to happen, including how many leads the migration is going to be affected. You can adjust your scope and test again as many times as you like, and only run the migration when you are confident it is correct. Viewing test output for a lead migration. The rest is easy. When you are confident that the test output is correct, just hit the Run Now button. When the migration has finished, you'll get a button below the output log taking you directly to the list configuration if you need to adjust the new list. When leads are migrated, en event is created in their activity feed. So you can always see when and how a lead was moved around between lists by looking at the lead. Viewing run output for a lead migration.